Left to right, Democratic Sens. Richard Blumenthal of Connecticut, Bob Casey of Pennsylvania, Jack Reed of Rhode Island, Ed Markey of Massachusetts, and Chris Murphy of Connecticut urge more funding for Amtrak at a press conference Thursday. Washington – Sens. 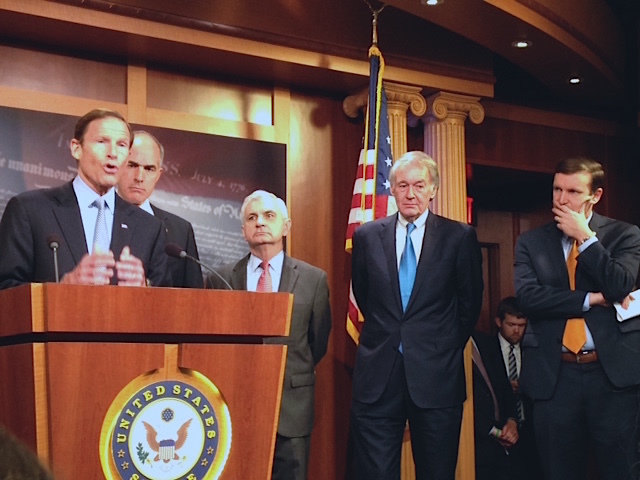 Richard Blumenthal and Chris Murphy are among a group of nearly a dozen Democratic U.S. senators trying to derail a proposed cut in Amtrak funding and instead help the passenger rail company tackle billions of dollars in backlogged repairs and capital improvements. Boehner last week said it was “stupid” to ask about Democrats’ charges that years of GOP cuts to Amtrak’s budget could have contributed to the fatal Amtrak derailment outside of Philadelphia. A Republican-controlled House panel approved a spending bill the day after that crash that would cut Amtrak’s budget again, providing the rail company with $1.1 billion, a cut of $251 million from this year’s budget. Amtrak is a publicly funded railroad operated and managed as a for-profit corporation. Republicans say it is wasteful and inefficient because, outside of the busy Northeast Corridor, Amtrak generally doesn’t turn a profit. Some Democrats want Congress to provide even more money so Amtrak can tackle a $21 billion backlog of repairs and capital improvements. At a press conference Thursday in the U.S. Capitol, Democratic senators from the Northeast competed among themselves to be the harshest critic of the House Republican effort to cut Amtrak’s budget. NARP Vice President Sean Jeans-Gail said he is hopeful Sen. Thad Cochran, R-Miss., the head of the Senate Appropriations Committee, will restore the House’s Amtrak cuts because he has voted to restore cuts to the railroad in the past. “We are going to get enough to keep Amtrak going for another year, but not enough to address a backlog of problems,” he said. One problem in boosting Amtrak’s funding is spending caps imposed by the Budget Control Act of 2011. Under that legislation, automatic across-the-board spending cuts are implemented if Congress busts those caps. Still, Sen. Ed Markey, D-Mass., is pressing for $2 billion to help railroads implement positive train control, a technology that could have stopped the train that crashed in Philadelphia. And Murphy supports setting up a special $500 million fund for transportation issues in the Northeast Corridor. The Philadelphia crash has also prompted other congressional action. Blumenthal introduced a bill this week that would increase the amount of money Amtrak could pay to settle suits from the victims of the Philadelphia crash. In the early 1990s, Congress set a limit on Amtrak’s financial liability at $200 million, an amount that is believed to be insufficient to cover medical expenses and other damages from the May 12 derailment. Early voting in Connecticut got a big and bipartisan boost Wednesday night in the House of Representatives.